U.S. To Saudis: Please Pump More Oil! 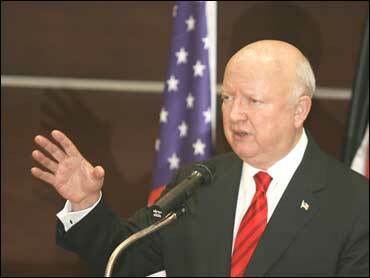 U.S. Energy Secretary Samuel Bodman told Saudi Arabia's oil minister Saturday that OPEC should increase oil output. Bodman told reporters before his meeting with Saudi Oil Minister Ali Naimi that oil production should be increased in order to meet growing demands. His visit to Saudi Arabia - which has the world's largest supply of oil - come just before a Feb. 1 meeting of the Organization of Petroleum Exporting Countries meeting in Austria in which the oil cartel could consider increasing oil production if it deems it necessary. It also comes less than a week after U.S. President George W. Bush raised the same concerns in Saudi Arabia. Mr. Bush said oil prices were very high and "tough on our economy." The White House said Wednesday that Saudi Arabia's King Abdullah told Mr. Bush that he was worried about the effect of high oil prices on the world economy - but there was no commitment from the king about increasing oil output. On Tuesday, Naimi said that Saudi Arabia would raise production levels only when the market justifies it, and that the current inventory seemed normal. OPEC oil accounts for about 40 percent of the world's needs, and OPEC ministers often follow the lead of the Saudis when discussing whether to increase production to take the pressure off rising prices. Crude oil prices inched up Friday after three days of losses as investors struggled with concerns about the U.S. economy. Light, sweet crude for February delivery rose 44 cents to settle at $90.57 a barrel on the New York Mercantile Exchange on Friday, but prices alternated frequently between gains and losses.